Pretty much all the best rock bands in the world today come from Melbourne, Australia, and Twerps are at the top of that list. Range Anxiety is the band’s first album for Merge Records, and like their previous releases it’s full of understated guitar pop that doesn’t fit snugly into any of the boxes people try to squeeze it into. It’s not precious or cloying enough to be twee, and not trying to be sophisticated or literary enough to completely bear comparisons to the Go-Betweens or Belle & Sebastian. 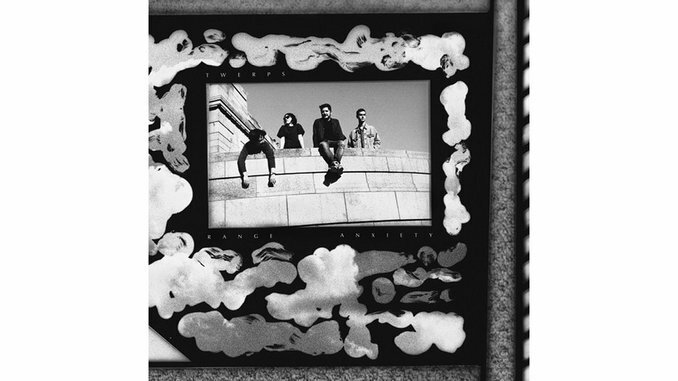 Twerps owe more to the slightly nervier work of the Bats or the Feelies, with songs that are fidgety but not raucous, confident but not arrogant. It’s the recipe that the Flying Nun label became known for in the 1980s, barely updated for the 2010s. It’s college rock for the post-college radio era, a Spotify favorite that should be blasting from the far left end of your radio dial. The band doesn’t deviate far from its formula on Range Anxiety, its second album. Their songs are made of simple hooks with intricate guitar lines and picking on top of jangling chords. Vocals are split between Jules McFarlane and Marty Frawley, often hushed or buried in the mix, and always unassuming. There’s often a hint of sadness, but they rarely sound dejected or resigned. Tempos don’t stray far from a steady lilt, and the rhythms remain straightforward. It’s simple and direct, and anybody who’s ever picked up a guitar or tried to write a song knows how hard it is to sound this easy. Even at their most technically complex, Twerps still maintain a low-key, laidback, indie-rock appeal. They pull off charming pop that sounds tender and thrilling at the same time. On “Back to You” Frawley sings “somebody out there is doing better than me”; when it comes to this kind of pop music, nobody right now is doing it better than Twerps.